Bavaria, the German state of my heritage, and a historically bitterly independent region, is very proud of its dialect; never before in Bavaria, however, had I seen this dialect extend to the names of stores as I now saw it in Hamburg. 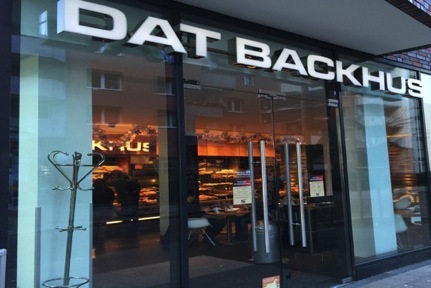 On the corner of the street my hotel was on I ran into my first "Dat Backhus", a dialected pronunciation of "Das Backhaus", or "The Bakery". This bakery turned out to be a chain with locations all over the city, and was just one of many examples of the fierce pride that Hamburgers had for their form of German. I continued on past the bakery along a street that wove through the upscale district I found myself in, which seemed to be split between residential apartments, hotels, and office buildings. It was all very tasteful, it seemed to me, and it was all brick; my first taste of what I would find to be an infatuation with brick that spread across the entire cityscape, from older buildings to new. It reminded me very much of Portland's pearl district, very modern, industrial chic, the steel and brick construction blending the lines between industry and style. As I was determined not to look at a map to guide me for a number of reasons (not the least of which was my utter inability to read a map), I was pleased to find that the entire city was adorned with white signs that pointed in the direction of the city's top sights and districts. I stumbled across one of these signs that pointed towards something called "Planten un Blomen", which, thanks to my initial encounter with the bakery, I made out to be another dialected name, as this name looked to me to be of a different language entirely. 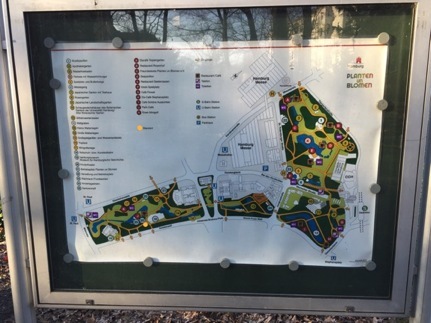 I deciphered it to mean "Pflanzen und Blumen", or plants and flowers, and was confirmed in this suspicion when I reached what appeared to be a massive city park. Upon finding this, I had to think again of my narrator, and his assertion that Hamburg was a remarkably green city, "Barbour Green", to be precise. 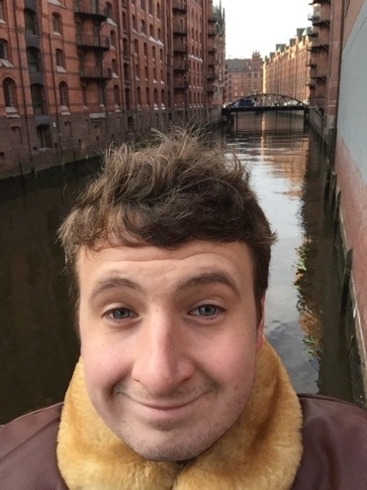 I had again, however, to compare it to my foremost point of reference, my home city of Munich, which boasts the "Englischer Garten", one of the largest parks on the continent. I thought too of Berlin, and the extensive greenery I had spent hours riding bikes through a few summers prior, and began to wonder if a massive city park was simply a staple of German cities in general; in other words, while "Planten un Blomen" was no doubt extensive and beautiful, I had yet to be convinced that Hamburg was any "Barbour Greener" than the other major cities I had visited in Germany. 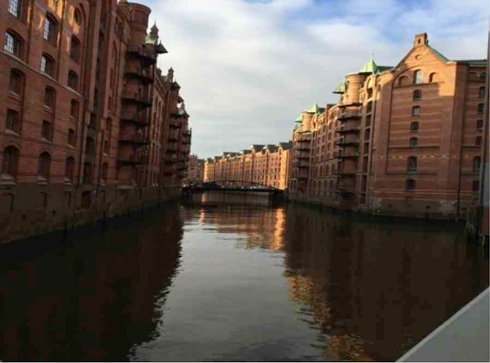 Throughout my time in the city thus far, I had stumbled across hardly a soul beyond the old woman who had directed me, and began to wonder whether people actually lived in Hamburg, and if so, where they all were. This question was answered, at least partially, a few steps into the park, when I heard loud pop music blasting through what appeared to be an otherwise barren landscape. Intrigued, I pressed on past a frozen pond, and an ancient looking building (one of the first I had seen) that housed Hamburg's museum of history, which also appeared to be deserted. 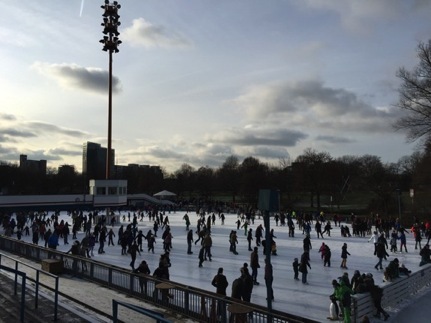 I rounded a corner, and saw that there, in the center of the park, was a massive, jam-packed ice skating rink. I was reminded of the childhood days I had spent in the Olympic park in Munich, sledding with my siblings and whatever chaperone was up to a day at the park. I remembered the sting of my cheeks and the glow of the sun off the icy snow, the thrill of plummeting down the hill and the warmth of my mother's embrace when I came home, a conquering hero, king of the hill. As it had been some time since I had heard children shriek with joy rather than agony, as they had done for the duration of my transatlantic journey, I stopped at this rink and basked in what appeared to be a real Hamburg Sunday morning hangout. It is always my hope, when visiting a city, to find locals; I have found on numerous occasions that the best place to do this was almost always McDonald's. Here, however, I appeared to have stumbled across a true hotbed of Hamburger life outside of a Hamburger joint, and lingered a moment to enjoy my find before pressing on. Leaving the park, I took a right across a square that seemed to mark the threshold between the upscale, industrial-chic neighborhood of my lodgings, and followed the signs toward the water, desperate to catch a glimpse of the harbor I had heard so much about. Again, on this route that wound past a second park adorned with a large monument to a man I could not recognize, the city seemed all but deserted to me; I chalked this up to the fact that it was, after all, a Sunday afternoon, but began to wonder where the other tourists such as myself were on this brisk afternoon. At that moment, I passed under a bridge that was home to a large population of homeless men, and emerged from underneath blinded by what appeared to be the source of the light that had so stunned me since my arrival; the harbor. This, I quickly discovered, was where the city came to life. Crossing a bustling bridge that connected the Underground station with the boardwalk, I was confronted with all of the smells, sounds and general signs of life I had to that point seen confined only to the ice skating rink. Shouts of ferrymen offering what was always "the last ride of the day, don't miss out!" mingled with the voices of those that attempted to make themselves heard to the fish salesman offering fried fish sandwiches and cones of fries washed over me, the smell of salt, fish, grease, and stale beer rose up and wafted under my freezing nose, and laughing children, flirting teenagers, Hamburgers and tourists old and young spanned as far as the eye could see along the boardwalk. 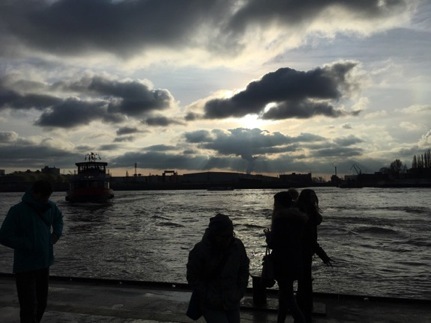 Hamburg was, I decided at that moment, a harbor city, not merely a city with a harbor. It was at this point that I witnessed what, to me, is the crux of any city; where tourists and locals are indistinguishable, basking equally in the glory of that Sunday afternoon by the water. As I walked along and saw the joy on the faces of the countless families, couples, and friends on their Sunday outing, I felt, for the first time on my journey, the supreme loneliness of travelling without companions. While I had been warned of this and, at least to some extent, anticipated it, it was not until this moment, surrounded by smiling faces yet with no one to smile at, that I grasped this loneliness. I thought of my narrator, who, other than fleeting interactions that invariably resulted in missed connections and lost friendships, was so utterly isolated in his quest. I wondered what it meant that he never seemed to mention this loneliness; did he suppress it, or simply choose not to accept its existence? Suddenly no longer in the mood for the crowd that had, just moments before, so intoxicated me, I took the next staircase off the boardwalk, across a crowded street and back into the neighborhood. Before long, the noise of the harbor faded into the distance, lulled, and died out completely; back on my own, the loneliness I had felt amongst the masses subsided, and gave way to an all encompassing tranquility. I heard and felt nothing but the concrete beneath the soles of my boots, broken occasionally by the squeaking open of a door, or a voice echoing from around a corner in the distance, audible, but too far off to signal the presence of another person. This shift from the harbor to the peace and shelter of the backstreets was reminiscent of leaving commons through the back door on a Thursday afternoon, the shift as absolute, the silence as profound. Venturing deeper into the calm, I stopped at one of the city's many thin canals, somehow exhausted, but oddly satisfied by what I had experienced. This was real, it was raw, I thought, and it was exactly what I wanted. Leaning against the railing and gazing at the still water that stretched through the neighborhood before me, I thought of my father and the extensive travelling he had done all of my life, and whether he ever felt the way I had just then. There was a thin line, I thought, between adventure and loneliness; I had always longed to venture into the world on my own, but just then, I heard my father's words in my head: Adventure is so much better when you have someone to share it with. Was that why my narrator had shared his journey? I turned back towards the harbor, eager to face what had become, in a certain sense, my fear. With powerful strides, I followed the winding streets, listening for the buzz of the crowd that would lead me back out of the sheltered neighborhood and into the heart of the city; the boardwalk. Before long, I was following the waterfront throng as if pushed by an invisible force, the determination of my stride fading with each step, but increasingly at ease. I was going nowhere in particular, I realized, the guiding signs having disappeared, and seeing nothing but people on one side, and water on the other, both stretching as far as the eye could see. For perhaps the first time in my life, I was drifting, aimless, seeing and smelling, but nothing more. I had nowhere to be, no one and nothing waiting for me on this particular day, in this particular place in the world, but it was not loneliness that this realization led to. At that moment, and from that moment on, the journey began to represent just one thing; freedom. The narrator was my companion on a journey that would span Germany, and we were together in our solitude, ready to face whatever lay ahead, head on. I didn't know what this journey would bring, and for weeks leading up to it, this had lead to many questions; what will I do? Will I feel what he did? Will I be able to express what I saw? Will I live up to his journey? At that moment, however, drifting along the harbor with the sun on my face and the whole journey before me, I had but one response: Bring it on.